We are fully qualified in stone restoration, repairs, cleaning and polishing, and we only use the most up-to-date machinery, tools and products. 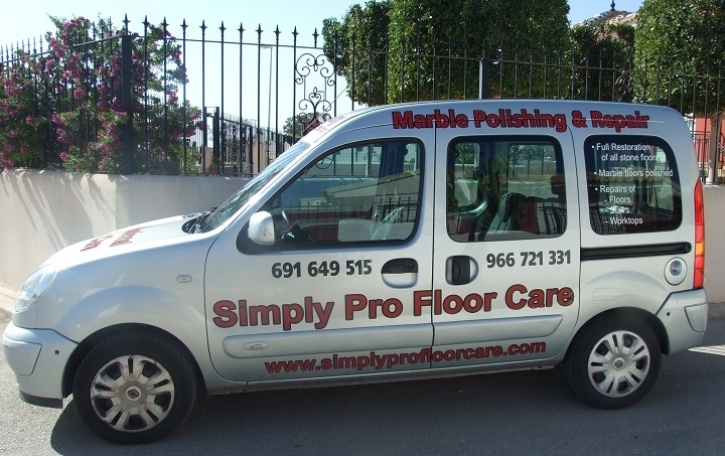 If every day wear and tear has removed that high gloss shine from your marble floors or furniture it's time to call Simply Pro Floor Care for our special granite and marble restoration and polishing system. Granite, Marble and other stone floors will stand up to a lot of use but hard water, dirt, grit, shoes and a whole host of other things we use daily will eventually make that once lovely floor look tired and lack lustre. Outdoor stone and ceramic tiles are cleaned with a scrubbing machine then extraction rinsed and small hard to get to areas are cleaned by hand. We do not use high pressure sprays that damage your grout and make a mess of your outside areas, balconies or roof terraces.We are fully insured and registered in Spain with references available both in Spain and the UK.